ANGELS WITH DIRTY FACES (1938) --- Simply the summit of gangster melodramas at WB. This was what Cagney got as gift for returning there after his Grand National misadventure. Angels would be remembered as well, or better, than Public Enemy, Rocky's walk to the chair a masterstroke of did he or didn't he (turn yellow). Jim and Pat O' Brien had worked together before, never so effectively as here. JC got one look at how Warners dressed their backlot tenement and had to admit there was no place like (his studio) home. I've read how Dead End Kids teased/picked on Humphrey Bogart, but that Cagney jerked knots in them, which may prove that Jim was the tougher Warner guy. Considering their respective upbrings, there's little doubt of JC being more streetwise, and it's known he didn't take Bogie's bad-act too seriously. I love Angels' street scene: it's slummy, but somehow you're home there. Did girls lovely and benign as Ann Sheridan live in such places? I could do with six or a dozen suits like ones Jim wears here. Background music at the El Toro sounds great. Wish it were CD pressed. Don't any of the Dead End Kids have parents? I showed Angels to a GF once and she was alarmed by aggressor way Cagney fired a pistol. He brandished firearms similar to florid hand gesturing of precode beginning (the wife had warned him about overdoing that after seeing Hard To Handle). In fact, Jim did every physical thing in a style unlike others, reason, he might have argued, for getting big bucks. It wasn't known then that terms for Cagney returning to Warners included percentage share of rentals. Had others on WB straight-wage list found out, there might have been mutiny. How valuable was he? More so, I'd guess, than anyone who worked at the firm until Bogart broke out, and by then, Cagney was gone of his own accord. Angels With Dirty Faces is likeliest the one that set JC upon icon status. 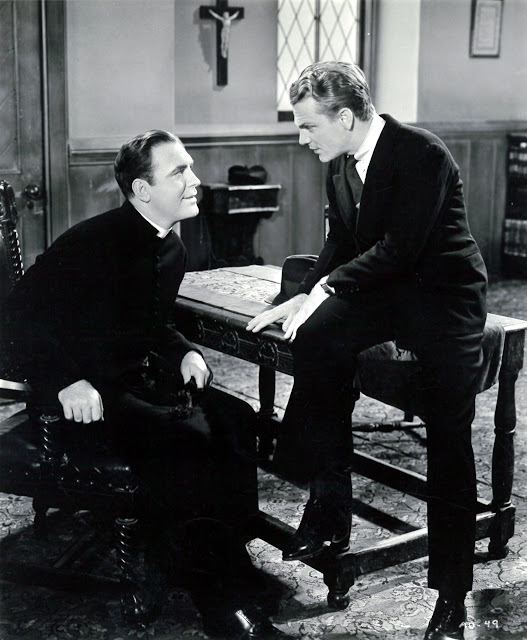 He got several critic awards for Best Performance that year, even though the Academy gave theirs to Spencer Tracy. Directing Mike Curtiz gets full value from Angel set-ups, each abetted by quick-time edits that move 97 minutes like half that. This may-be my favorite 30's movie that isn't comic or horrific. The Dead End Kids are in check and register as distinct personalities. I'd guess this was where moulds were firmed for decades-ahead work on East Sides, Boweries: sites and labels to come. Humbled star George Bancroft and up-and-coming Bogart supply sinister backdrop. Would Father Jerry have gone as hard on Rocky had he realized the latter twice saved his life? That first occasion on railroad tracks would have clinched a lifetime pass from me: I'd not clamp down on Rocky from that point no matter what he did. Frankie Burke playing Sullivan-as-kid has uncanny resemblance to Cagney. Was he coached by his model? JC's powerful last scene is solely done with voice, plus hands clutching at a radiator. For impact that has, you'd imagine in hindsight seeing Cagney writhe head-to-feet, and there's the measure of his great performance. CHINA GIRL (1942) --- Originally tabbed as a bigger picture to star Tyrone Power, China Girl came off Fox assembly a less stable "A," but well-written (Ben Hecht) and visually a beaut (that emphasized by 20th's On-Demand DVD). 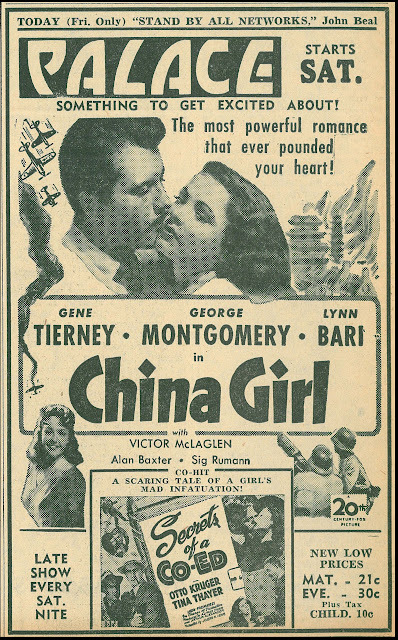 China Girl is romantic fantasy of pre-war, soldier-of-fortune George Montgomery unwilling to commit until met by half-caste Gene Tierney (the story was Darryl Zanuck's, scripting by Hecht). Nippon opposition is alternately labeled "lice" and "monkeys," a Chinese village populace machine-gunned for an opener atrocity to get points straightaway across. Fox approximates oriental setting as we'd imagine, or prefer it, China Girl at times like a bigger budget Mr. Moto. Hotel interiors, dining area, and bar were splendidly realized in LA's Bradbury Building, atmospheric site where D.O.A. and scores of noirs would later play out. Characters like Montgomery's reflect America's reluctance to enter the conflict, so it has to get personal for him to arm up (how long would the US have waited if not for Pearl Harbor?). Lynn Bari, called Queen Of Fox B's, commends herself well as agent for the Japs who switches loyalty in GM's favor. Directing Henry Hathaway likely took this purely as assignment, but what skill and panache with action he brings. 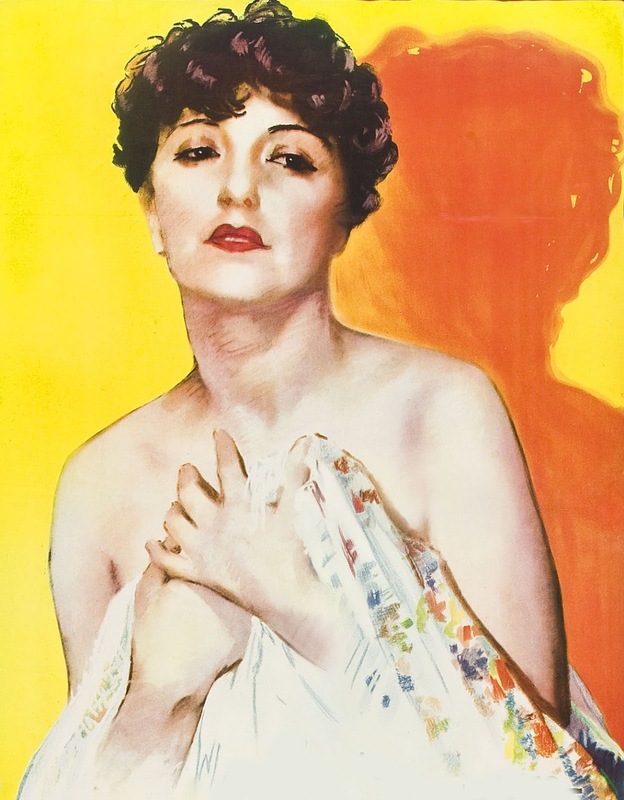 THE GIGOLO RACKET (1931) --- Helen Morgan put been-there feel into torch singing that made up for lack of voice range, so startling is comparison with Gogi Grant, who'd put over with dynamic force the HM catalogue as vocal stand-in for Ann Blyth in 1957's bio-pic, The Helen Morgan Story. 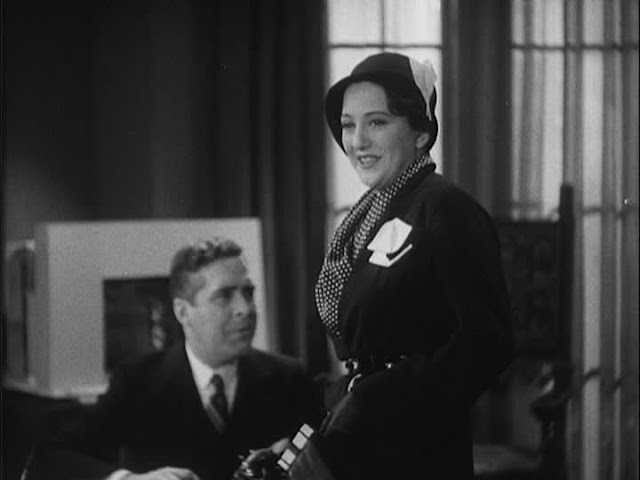 The Gigolo Racket was a Vitaphone two-reeler said to be Morgan's only appearance at less than feature-length. She's matronly at age thirty --- what a hard road this woman traveled. You could wish for twenty minutes of concertizing rather than two songs and the rest contrivance of star Helen going along with manager John Hamilton's scheme to pair her with a gigolo for publicity purposes. Morgan was deep in the sauce by 30's juncture, but had presence and tragic grandeur lent by years at speakeasy perf'ing and selling out Broadway in a legendary Showboat turn as Julie LaVerne. Helen might have been a great character actress in films given better circumstance, this based on wow work in Applause and the 1936 Showboat. She and stage colleague Jeanne Eagels were somewhat alike for dynamic, though limited, screen appearing, then premature lights out. The Gigolo Racket is another gem off Warner Archives' newest Vitaphone shorts DVD set. George Montgomery's character in "China Girl" wasn't the only one who didn't get the big picture in our country. America First, the leading anti-war organization, enjoyed immense support until the very day of the attack on Pearl Harbor. Even as late as Thanksgiving of that year, polls indicated that a majority of Americans favored helping Great Britain, but only if it didn't involve actual fighting. President Roosevelt had promised Prime Minister Churchill all along that the United States would help Great Britain, but he'd only been able to get the Lend Lease Act passed by Congress, allowing the United States to transfer war materials and 50 old destroyers to Great Britain. This resulted in a number of incidents between German submarines and the United States naval ships escorting the munition ships, but Germany was aware of American sentiment against participating in the war and tried to avoid direct confrontations, for fear of upsetting it. Had the President sought a declaration of war from Congress at that time, he probably would not have gotten it. The focus of the country, of course, was on the war in Europe. All through the summer, however, American diplomatic relations with Japan had been deteriorating. Our government had essentially told Japan that it would have to leave China and that, until it did, American oil, scrap metal, and other raw materials would be withheld. Since Japan had no source of these materials of its own, its choice was either to concede to the United States or to broaden the war by invading the East Indies, then a Dutch colony, where there were vast oil reserves, and the British colonies of Burma and Singapore, with their raw materials. Given the disparate strength between Japan and the United States, the Japanese knew that if they followed the war path, they would have to strike first and quickly. By December, President Roosevelt and key members of his administration anticipated a Japanese attack within days. A question remains as to whether they knew that it would be against Pearl Harbor and deliberately withheld this information from the military commanders there, to make sure that it would be the Japanese who struck the first blow. An intensive Congressional inquiry after the war was not conclusive on this point, and it has remained a matter of contention between historians ever since. It was known that military intelligence had broken the Japanese "Purple" code months before the attack, but the Congressional investigating committee found that the central intelligence files had seemingly been culled of most of the relevant intercepts resulting from it. A few years ago, however, it was discovered that the files kept at the intercept stations themselves were fairly intact. These indicate that our military intelligence was aware of Japanese interest in Pearl Harbor and was tracking the Japanese war fleet which conducted the raid. While the implications are clear, there has been a reluctance on the part of historians to implicate the Roosevelt administration, in the absence of direct evidence demonstrating that it was aware of this information. After the attack on Pearl Harbor and Germany's declaration of war against the United States three days later, a director of America First telephoned Charles Lindbergh, its leading spokesman, to say, "Well, he got us in the back door." Most historians regard the German declaration as gratuitous and a blunder on Hitler's part, since the declaration of war approved by Congress on December 8th was only against Japan. However, on December 4th, three days before the attack, the Chicago Daily Tribune published a lead story, "F.D.R's Secret War Plans." It reported that if the United States went to war with Japan, the President intended to have war declared against Germany as well. There is speculation that this information was leaked to the newspaper by the Roosevelt administration itself, in anticipation of the Japanese attack. While war against Germany was certainly in the President's plans, there was no desire on his part to ask Congress for a declaration of war if it could be avoided. By making Germany aware of what coming down, Roosevelt forced Hitler to act first, in order to strengthen his alliance with Japan. These comments only suggest the manuvering going on behind the scenes. Shrewd men in our government realized that most Americans had no desire for war, however necessary they thought it was, and that a divided country would not be an effective combatant in what promised to be a severe test. Every patriotic American, however, would rally behind the flag if the country was attacked. So, when it became personal for George Montgomery's character in "China Girl," he knew what to do. Hi John, perhaps if Flynn had known of Cagney's money deal, he "would" have killed Jack Warner. Which brings up my question: who was the biggest money maker at Warners? Considering his longevity, I always thought it was Flynn. 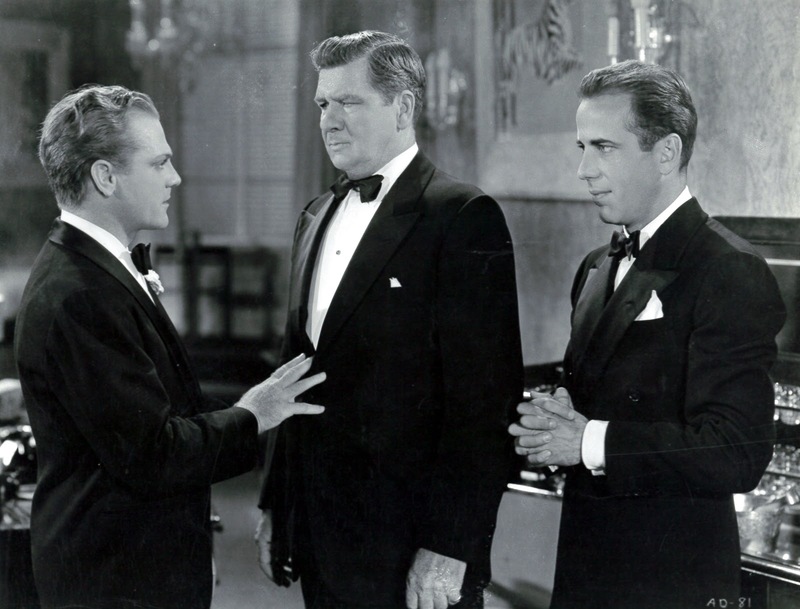 You infer Cagney and Bogart as most valuable. The Warners were nothing if not bean counters. Do you have dollar and cents info on this? Your dedicated reader, Alan Litwin. Hi Alan --- I agree with you that Flynn was the most valuable of Warner stars --- his longevity did surpass even Cagney and Bogart. My impression of the numbers is that Flynn was a consistent profit-getter from 1935 and "Captain Blood" all the way to 1953 and "The Master Of Ballantrae," also a hit. At their respective peaks, however, Cagney and Bogart seemed to have been respective Kings Of The Lot, theirs being top profit pictures of those peak periods. "To Have and Have Not," for instance, took substantially greater profit than Flynn vehicles being released around that time. After "Casablanca," Bogart was the No.1 money star at WB, and his profits for the most part surpassed Flynn's up to the point where he left Warners, but Bogart did not have the solid eighteen years of earning for WB that Flynn had (he was there for almost as long, but didn't achieve lead man stardom until the 40's). 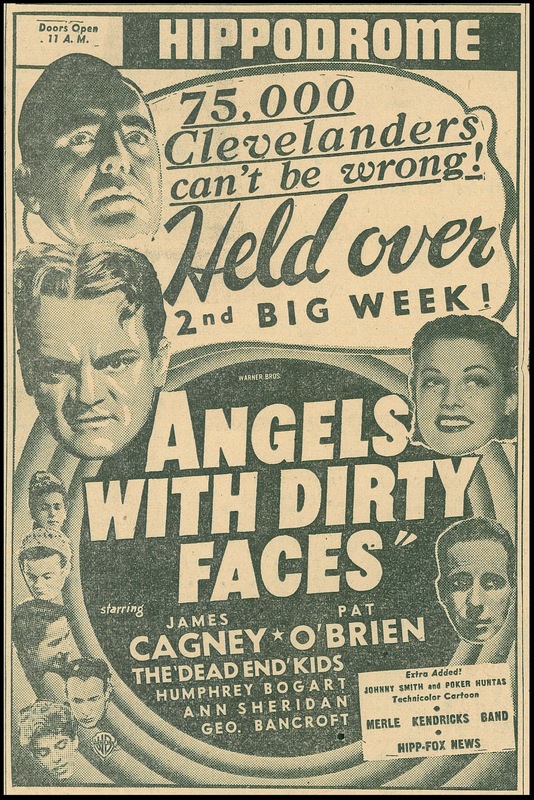 I'm going to have to watch "Angels With Dirty Faces" again! Your review (and the movie) make me wonder about how long ago Warners constructed what still remains of their generic "New York" that appears in this movie, and is indeed magnificently convincing (?) While I worked on the lot for three years as late as between 2003 and 2006 on "Without a Trace" (egghhh....not exactly "Angels With Dirty Faces"! That's the biggest irony...working on any POS on any of the famous 'Hollywood' lots today, while wondering about the great classics that were once shot there), the largest section of the still-standing, still-in-use "New York Street" was alternately referred to as the 'DeCuir' street, I believe. This is not good for quotation as I'm too shaky about it, but the more definite sense I have is that it was built for a film made within the last 30 or 40 years, but not the required 70-plus years to qualify for having been the backdrop we see in the Curtiz picture. I wish I knew. It's trivia, no doubt about it. It doesn't change anything about the past or the present. But, what the hey, right John? It's what we love! That's reason and excuse enough. I DO know that there is a kind of 'back alley' annex toward the northern extremity of the lot, an extension in the same style and character as the adjoining generic 'New York' street[s], that appears to me to be considerably older than the rest of it. So of course the romance of that is to wonder if there are at least portions of what one sees there today that DO go "all the way back". This, as you no doubt know, can no longer be said about almost all of the Universal backlot, which seems at least to have suffered more fires more often than any other major lot. I know for certain that the truly terrific New York (and really, any other generic U.S. metropolis) section on the Universal lot that I saw when I worked there, aged 24, in 1977, burned down in the '80s, I think it was, when that damn demented guard deliberately started a fire just so he could be "Johnny on the spot" and be the first to report it, thinking that would earn him a special citation / raise / God knows what. Instead, of course, the aged, dry timbers (and I remember them well) behind the false fronts went up like turpentine, and it was all over before the studio fire engine could even get out of its garage. Damned shame. The rebuilt N.Y. Street section lacks a lot of the lived-in and credible quality of its precursor, very much as the reconstructions of the also-burned-down European Street area which once hosted so many wonderful, silly Universal horror pictures. You can see the crappy, cost-cutting 'European' section in some of those godawful "Night Gallery" episodes, which portray it very much as it looks in person, i.e., like hell. One thing at WB which is absolutely and positively original, in spite of many a change and 'upgrade' to its exterior over the long years, is the frankly famous 'brownstone' street, the very street you see those immense, long sedans careening down, sometimes skidding out and bursting into flames, in the classic WB gangster epics. And, I'm quite sure, 1,000 other movies and TV shows. Another use of them would be the shots of 'Father' taking in a Sunday with his family in WB's film version of "Life With Father". Oh, I'm sure it's been in an endless number of movies, and the funny thing too is that always, always at the western end of this very same street, the café was and still is located. Isn't that kind of fun? I often wondered if this so-familiar construction was original until one evening on "Without a Trace", working late, we used the standing set---technically an exterior---up into a hallway which had been specially constructed to extend the illusion it was a real building. (Obviously, common practice is to show actors entering an exterior set and cutting to an interior, matching set built on a soundstage.) While up there doing my 'stand by makeup man' thing, I was immediately and easily able to determine, from the look and condition of the framing, that this was without any doubt whatsoever a piece of construction done in the early '30s. One giveaway is that there are real 2 x 4's used in its construction. As you may or may not know, current-day 2 x 4's are the same as current day Hershey bars---that is, a lot smaller in dimension than they were originally. If you take a measuring tape to a nominal 2 x 4 you'd go buy at a lumber yard today, you'd find out that they're really closer to being 1 x 3's, and change! These were not---these were the husky, old fashioned Real McCoys. Also, since the set has presumably been out under the elements since the early 1930s, the wood shows staining from rain leaking through, birds (no comment), and all the other signs of 'antiquity' you'd hope to see if you're a movie-mad former couch potato like me. And, "that's not all! ", as Popeil used to say about his TV products. There are many, many other buildings (exteriors) all over the WB lot that also date back easily to the 40s, anyway, and when I revel in watching an old Bogart or Cagney or Flynn picture, et al, I love seeing structures I know I've seen myself. Would that I could have a seance near any of them and hear from any one of the fabulous shades who once worked at WB. Part Three and conclusion of Craig Reardon on WB stars and behind-scenes make-up realities. Thanks for all this great stuff, Craig! On a different but semi-related note, I enjoyed (as I always do) some of your fabulous stills, in this case of Ann Sheridan, who was delightful always. Sure, she wrecked herself smoking, but as a youngster she was already 'smoking', to use the common term for male appreciation of a woman's pulchritude. In the '90s I was involved in a project I must have referred to, refurbishing some old plaster life masks taken of various famed actors by the former WB makeup department (which hasn't existed for many years now, unfortunately.) One of the aspects of this which was the most fascinating to me was to see some of these great players, as represented by plaster proxies, all laid in a row so that they could be compared to one another. And, the amazing thing was the difference in the size or dimension of their faces, their very heads. You never really think about that! Mary Astor had a remarkably small, angel face---even though the mask they had of her had probably been taken around the time she appeared in things like "The Maltese Falcon", versus her silent stints at WB when she was an incredibly beautiful ingenue. She was still beautiful, but take my word for it, since my business is faces---this was a woman in her late 30s or 40s, at least. Still, fascinating. I think they still had a mask of Olivia de Havilland, also an incredible beauty, and also startlingly petite. We come to Ann Sheridan...and yes, they had one of her, too. But now, you're talking about a lady who was NOT a little tiny thing. By the evidence of her life mask, she was a more "life sized" lady. Also interesting are old "behind the scenes" pictures of her, including one in particular I remember where she appears to be coming down the steps of the old makeup department at the studio, and she is NOT wearing a stitch of makeup. Like Cagney, in fact, a lot of her was 'painted on'---for she, again like Jimmy Cagney, was quite fair, and her eyebrows and eyelashes were of the blonde variety, which tends to photograph rather blankly. So, both performers...male and female...would have these darkened and accented. In fact, you don't have to be a makeup artist or even look too carefully at certain movies and stills of Cagney in the '30s into the '40s without being able to tell at the very least that his eyebrows are quite obviously drawn on! No, he had eyebrows alright...he didn't suffer from alopecia! 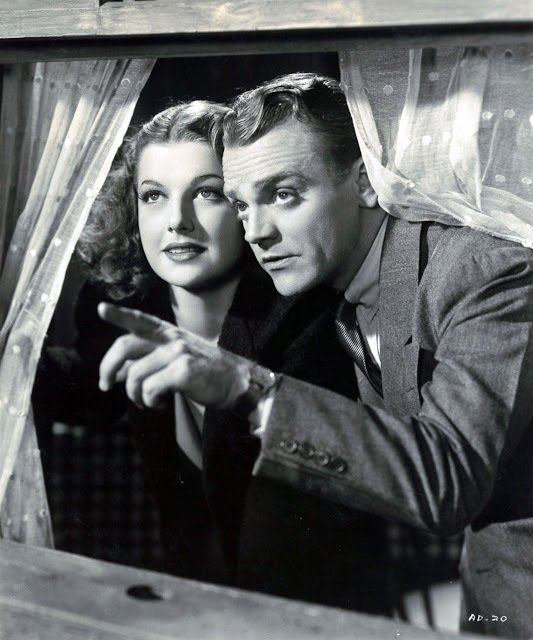 But, the makeup men apparently were more used to doing women, so rather than simply darkening Cagney's natural brows, which is sure what I would have done, they often drew on a rather artificial-looking simulation of an eyebrow right in the midst of his own white-blonde brow. This of course is micro-B.S., but I thought it might amuse you. You can see the extent to which I'm perhaps over-interested in minutiae, where my beloved oldie-but-goodie movies are concerned! Finally, I had a very nice conversation with a very nice lady named Susan King, who writes on older Hollywood for the L.A. Times, in context with an inquiry she had about the late John Chambers, who's portrayed by John Goodwin in the very good thriller, "Argo". I'd known Johnny, as he was known to his colleagues, and was pleased to talk about him. Anyway, we had a wide-ranging talk about movies, since she turned out to be a kindred soul, and somehow or other I mentioned Curtiz, and said I rank him with the best, and better than some who've gotten way more genuflection from critics and buffs. She delighted me by telling me that he will finally get a proper biography. I can't, damn it, remember who she told me is writing it, but it's a critic and a friend of hers, who she said has had this in the works for years. I hope it's as good as a good Mike Curtiz film, in which case it'll be great! So, I take it the ending we know is a reshoot? Know anything about that, John? This setting (in the still) infers some kind of scene after the big set-to in the corral. Maybe Hawks decided this dragged everything out too much and decided to wrap it up quick right after the fight gets stopped by the girl (?) It actually ends a little too abruptly. I think of Hawks as a kind of idiot savant, sometimes. So many of his movies are entertaining and marvelous, but almost all of them have a sprinkling of stupid scenes in them, to my taste. Or, something about them that's silly or overstated. Even the 'realism' of the overlapping lines and faux nonchalance gets on my nerves sometimes. And yet...other times, by gosh, it all seems relaxed and real as life itself. Funny kind of filmmaker, Hawks. I do think that everything pretty much fell apart by the time he remade "Rio Bravo" a second (and thank heaven, for the last) time and called it "Rio Lobo". That's a movie that hardly works at all. Of course, it does preserve a kind of snapshot in time of the gorgeous Sherry Lansing before she became a movie exec, exclusively.